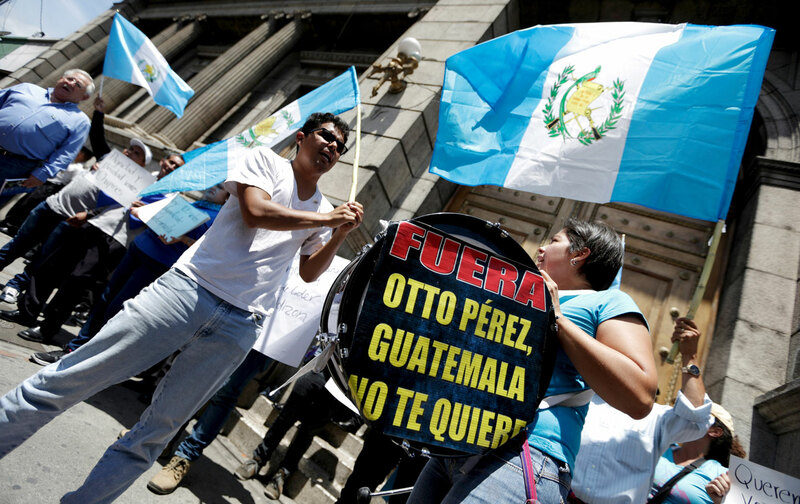 With its government about to fall, Guatemala is finally questioning the neoliberal orthodoxy of the post–Cold War world. The post–Cold War settlement put into place in the Central American countries of Honduras, El Salvador, and Guatemala—neoliberal “free trade” economics combined with limited constitutional democracy—is coming apart. In El Salvador, gang violence, itself a direct consequence of US Cold War policies, is making the country nearly ungovernable. In Honduras, the 2009 coup is still unresolved, with waves of mass protest alternating with waves of state repression. And in Guatemala, the nationalization of social protests (which previously had been localized mostly around opposition to intensified resource extraction) has just scored a major victory: In response to a national strike, Congress yesterday voted to strip the president, Otto Fernando Pérez Molina, of his immunity, which means he surely will be brought up on corruption charges (his vice president has already resigned, and a number of ranking officials have fled the country). He will soon fall, surely to be soon given a shove by the US embassy, which while appreciating his “free trade” law-and-order creds, didn’t like the stubborn independent streak Pérez Molina had when it came to questioning the insanity of Washington’s main orthodoxy: the drug war. The feeling in Guatemala, from what I hear from friends, is Jacquerie elation. Unlike El Salvador, with the FMLN, or Nicaragua, with the Sandinistas, Guatemala ended the Cold War with a completely disarticulated left unable to compete on the national level. Its postwar left comprised fragmented social movements, riven by racism and distrust: over the last decade, some parts of the rural highlands have mounted militant defenses against mining, biofuels, Monsanto, and other depredations. It is both true that corruption in Latin America is endemic and that charges of “corruption” are often a middle-class complaint, especially if there is a center-left government in power trying to mildly redistribute wealth. That’s what happened in Guatemala in 2009, when a so-called “white revolution” nearly brought down president Álvaro Colom. The country’s right-wing power structure staged an event—the “murder” of a Colom critic, Rodrigo Rosenberg—that sparked protests against Colom (who, like his Honduran counterpart, the ousted Manuel Zelaya, had cultivated support from peasant movements). It turned out that Rosenberg killed himself, staging his own death to make it look as if he was the victim of government repression. The only reason we know that is because of the work of the independent International Commission Against Impunity in Guatemala, established in 2006 and run by the United Nations. CICIG is a strange body. In another situation it could easily be dismissed as a neocolonial imposition meant to press order on a country so that it could continue to participate in the “international community” as a “responsible” free-trade partner. But Guatemala is a gangster state, ruled by a coalition of thugs, crooks, genociders, and very rich people left over from the Cold War. CICIG’s investigation into systemic corruption pulled the thread that unraveled the ball, implicating nearly every government official and serving to articulate Guatemala’s disarticulated social movements. On Facebook, friends from Guatemala are using the old but still bracing language of the structural left to describe what is going on: “the sectors are uniting,” “the conjuncture has opened,” and so on. It almost feels as if we are a step away from the program of the April Theses: Abolish the army; take the land; confiscate the banks; end the war (on drugs and on peasants). But the protest movement could easily be coopted or deflated in any number of ways. The institutional left is still divided, with some historical organizations inexplicably supporting the president; a number of umbrella groups, some with little connection to the countryside, have emerged to try to represent the oppositional coalition, and to guide whatever transition would occur were Pérez Molina to step down. The big question is whether presidential elections, scheduled for next week on September 6 with an expected run-off on October 20, will go forward. There are three “anti-establishment” candidates that could build on the energy of the street: Manuel Baldizón, a wealthy businessman, who would bring nothing but more of the same: corruption and hunger; Jimmy Morales, a comedian, who has no real organizational power and will just be a tool; and Sandra Torres, the wife of former center-left president Colom. As first lady, when Colom was president, the right hated Torres as much as they hated Colom, fearing she was using redistributionist policies to build a base among the rural disenfranchised. If the elections do go forward, and Torres manages to get into the run-off, she’ll be the one to watch.